Don't miss this once-in-a-lifetime experience! Taste famous Chinese regional cuisines from Beijing (North), Xian (West), Shanghai (South) and visit Laoshan, Columbia's sister city in Shandong province. Costs: $2950 per person. Fare includes international round trip airfares from Missouri. All transportation (bus, domestic flights and train ride) inside China, lodging (additional $700 for single occupancy), all breakfast, most of the lunch and dinners and admission fees to scheduled tourist sites. CFC members will receive a $50 discount on the tour. Begin passport and visa processing as soon as possible. A $700 non-refundable deposit to reserve a spot is due Aug. 15, 2007. Full payment is due by Sept. 15, 2007. A minimum 18 participants will be required to organize the tour. Fly from Missouri to China. Arrive Beijing. 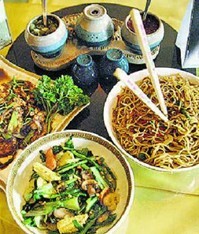 Start the enjoyment with a "green" Chinese dinner at a Bio vegetable garden (D). Great Wall, Cloisonne Museum. Beijing cuisine for lunch (L) and "Hot Pot" for dinner (D). Heavenly Temple, Tiananmen Plaza and Forbidden City. Beijing Roast Duck (L), Traditional Northern Noodle (D). Summer Palace and local food market. Emperor's banquet (L) and Beijing Dumpling (D). Overnight train to Xian. Spent a day in Tang Dynasty Park. Lunch exclusively with healthy natural grains (L), Tang dynasty peasant fares (D). Qing Emperor Tomb & Terre Cotta Museum. Farm home cooking (L), Xian Dumpling Banquet (D). Xian ancient city wall & market. Xian specialty lamb stew (L), Xian local favorite dishes (D). Fly to Qingdao, visit Laoshan. Qingdao steamed bun (L), Shandong traditional dishes (D). Mountain Laoshan, Tao temple. Sea food noodle (L) and Qingdao specialty dishes (D). Qingdao City tour, Beer Museum, German town. Coastal special dishes (L), Qingdao Pot Sticker (D). Fly to Shanghai, visit ancient water village Zhou Zhung. Zhou village foods (L), Traditional southern foods (D). Shanghai Temple & market. Green Ripples Restaurant (L). Return to USA. Lillian Sung, a native Chinese speaker from Taiwan, has a Master of Fine Arts degree from the Rochester Institute of Technology. Lillian has lived, taught and traveled extensively in China, including 18 months as the Associate Dean at the Inner Mongolia Normal University. Lillian has comprehensive knowledge of Chinese history, culture, medicine and art. She is a tea connoisseur who also enjoys preparing gourmet Chinese dishes . This spring Lillian taught basic Chinese for the Columbia Public School Adult Education Program. Many of her students toured China in May 2007 and were able to use the language skills they learned from Lillian to interact with the Chinese people and enrich their experiences in China. Lillian Sung: yinlingsung@gmail.com, (573) 449-6388. Hsiao-Mei : Wiedmeyer2@mchsi.com, (573) 808-6307.